The year 2016 will be remembered as the perfect time to be bissextile. Several hundred people experienced one of Longyearbyen’s most spectacular “return of the sun” celebrations ever, thanks to leap year delaying the ceremony from a cloudy Monday to a cloudless Tuesday. Wearing sun costumes, facepaint and other solar insignia, they began their annual chant toward the southern horizon at 12:50 p.m. while circled around an ancient set of wooden steps that have not seen sunlight in four months. Local kindergarten students in sun costumes enjoy a few final minutes in the shade before the sun shines on the old wooden hospital steps during the “return of the sun” ceremony Tuesday. Photo by Mark Sabbatini / Icepeople. For maybe 30 or so seconds, the gods of darkness resisted. But they were overpowered by the increasingly vigorous shouts and a perfectly clear sliver of an dazzling ellipse peered over the glacial mountainside. That lit up the crowd even more, forcing the rest of the sun to spill into the sky with haste and turn the chants to cheers. Astrid Andersen, 6, is presented with a framed print of her winning Solfestuka logo during Tuesday’s ceremony. Photo by Mark Sabbatini / Icepeople. 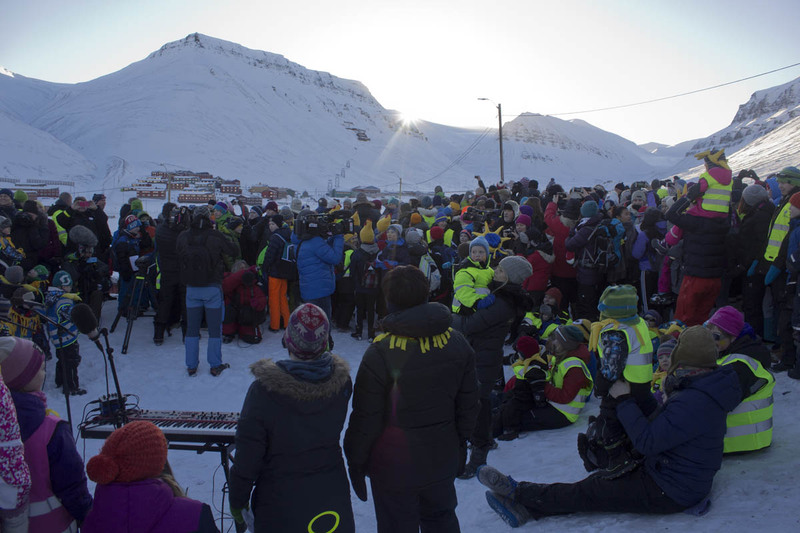 It’s been at least a decade since the sun was clearly visible during the ceremony that’s the highpoint of the nine-day Solfestuka festival that began Friday, declared by Longyearbyen residents in an online poll to be their favorite annual cultural event. “There are lots of days that are cold, windy, snowy and foggy,” Hutzschenreuter said. 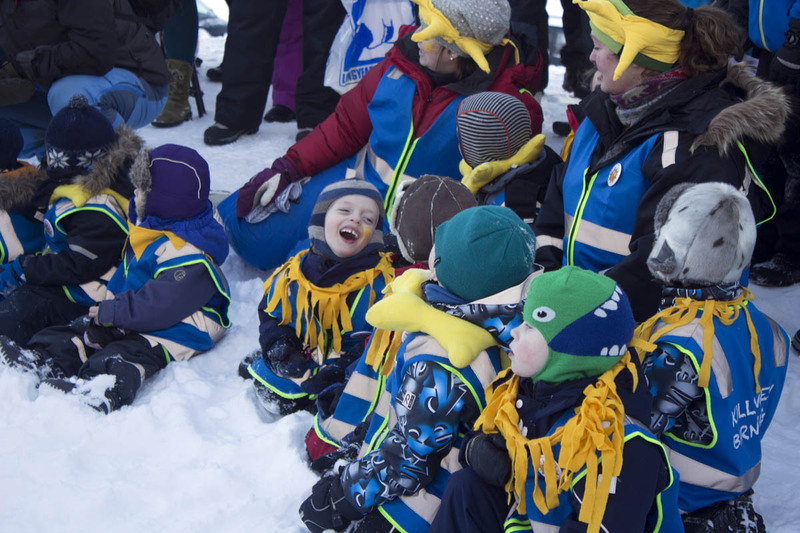 As always, local youths dominated the ceremony that began at 12:30 p.m. with songs, sing-alongs and more chants for Astrid Andersen, 6, who was selected from about 85 students as the winner of this year’s Solfestuka logo contest. 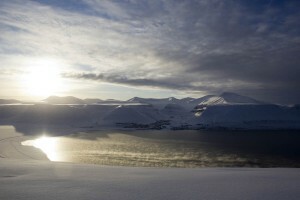 Although Longyearbyen’s first official sunrise was Feb. 16, most of the town remained in shadow at midday Sunday due to the surrounding mountains. Photo by Mark Sabbatini / Icepeople. The ceremony takes place around the wooden steps of a hospital next to Svalbard Church that was destroyed during World War II. Although the first official sunrise in Longyearbyen was Feb. 16, the surrounding mountains deny sunlight to most of the town for a few more weeks – and the old steps are where the first “in-town” rays appear. Longyearbyen had nine hours and 32 minutes of official daylight (plus more than four hours of visible twilight) even though it first “saw” the sun Tuesday. But the length of days will continue growing rapidly, with the town entering 24-hour visible twilight April 5 and beginning its’ three-and-a-half months of 24-daylight April 19. 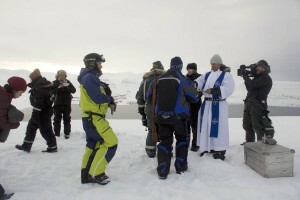 Svalbard Church Priest Leif Magne Helgesen offers Communion to congregants during an outdoor Mass on Sunday on Hiorthfjellet. Photo by Mark Sabbatini / Icepeople. This year’s Solfestuka began with a revue show Friday and Saturday nights mostly satirizing events of the past year, although tragedies such as the Dec. 19 avalanche that killed two people were handled much more tactfully. It was definitely a moment. Not quite the solar eclipse of a year ago, but to have such a clear sky (when the forecast called for clouds) after so many years the energy was definitely way above and beyond any of the previous “countdown” moments I’ve been a part of. Actually, it’s worth mentioning (and I probably will add to the article) there is an actual countdown most years. They skipped it this year and just did the chant, which I thought was far more engaging. One of those days (and weeks, for that matter) where it makes no sense to live anywhere else. BTW: Had a LOL moment reading a Facebook comment about my photos that simply stated “Freia is cool.” As I noted in equally simple terms: “Indeed.” She has seen and experienced more than almost anyone might imagine (and she was one of my neighbors who was thrown out of Gamle Sykehuset), yet is so incredibly cheery and friendly that I just want to spend hours talking with her about her story – without a notebook or anything, but just because I’m interested.